In the summer of 2008 Gay Jensen went to Alaska, and one of the highlights of her trip was seeing bears congregate at Brooks Falls to feed on the salmon run. Being that close to so many bears was an experience that had a huge impact on her emotionally and spiritually. 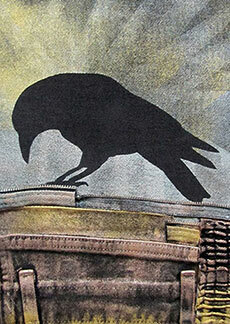 When she returned to her Seattle home she knew she wanted to make an artwork about this adventure. 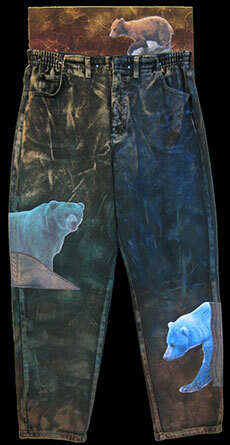 Using photographs she had taken of bears at Brooks Falls, the pair of old jeans she wore on the trip, a piece of scrap wood, paint, and leftover fabric from a quilt project, Gay created “Encounters Remembered” (see image below). 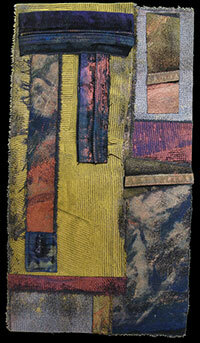 When she worked on “Encounters Remembered” Gay loved the way the denim fabric of her old jeans reacted to the paint. 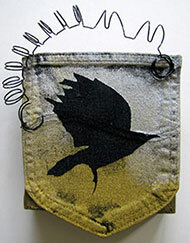 This led her to seriously consider used clothing as a resource for other art projects. 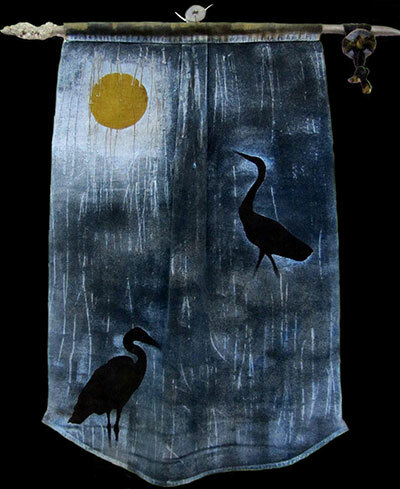 She began making recycled artworks using not only old jeans but also old corduroy pants and shirts and other discarded clothing that had interesting textures. Using materials that would otherwise be discarded is not only a win for the environment but for her as an artist. Since the materials are free she feels freer to work instinctively—she is not afraid she’ll ruin them by experimentation and pushing the limits.